Sunday I met up with my sisters for the main reason for this trip - a combined Mothers and Fathers Day present to take our Mom and Dad to a ballgame and the African American Museum (that parts today.) 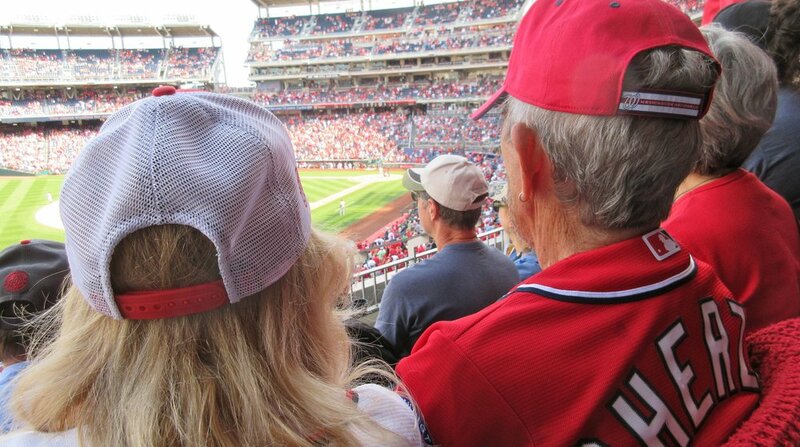 Mom and Dad became big Nats fans a few years ago when they were recovering from a car accident and were stuck at home all Summer. They still watch nearly every game, but had never come to one in person. They showed up in full regalia, and It was my first time to the Park. The weather was perfect and it was a fun day and a fun game, plus as a bonus I got to see my friends Stan and Leslie again, who are huge Nats fans themselves. The Nats happened to clinch their division championship, so we got to enjoy that celebration, too. We finished up the day with my nephew Ryan, grabbing some dinner at Union Market (like a mini version of LA's Grand Central Market).